HB2 is the same bulb as 9003 and H4 - Typically 55W when in halogen form. Dual filament - High and low beam from the same bulb. Our kit will convert the low beam to HID - High beam will be left in halogen form. These bulbs are yet another version of HID bulbs that help car owners to have a safe and sound journey during the night. 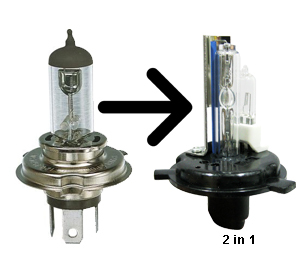 With these high power bulbs, there is an increased visibility of the road to up to 70%. Similar to various other counterparts, these emit a light that is three times as powerful as halogen bulbs and they also provide a light which resembles natural daylight. The lifetime or longevity of these bulbs is also high. These are most suitable devices when you take into account the practical road safety conditions. Usually these kind of HID xenon lights are provided along with the likes of high end cars like the Jaguar or the BMW. But using this feature, you can accessorize or customize your vehicle without putting in a lot of cost or effort to alter the model of the car. They provide style and sophistication.